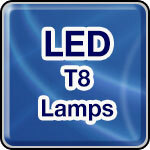 LED T8 tubes are now used for industrial, commercial and household lighting. LED T8 tubes provide the same amount of light as fluorescent T8 bulbs, while using less power and lasting much longer. Replace all of your fluorescent tubes with LEDs and make your home, office or building lighting more efficient.